Mike and others who are troubled by Intelligent Design advocates who do serious science and publish in leading scholarly journals (please see my web sites for a list of my publications) need not be so worried, for part of the foundation of modern science was laid by men and women who believed in a designer God. In our feature, we recognized Mims specifically for his contributions as an amateur scientist, and we stand by that assessment. His work on the Altair 8800 computer, on RadioShack’s home electronics kit, and on The Citizen Scientist newsletter has been undeniably influential. DISCOVER does not in any way endorse the Discovery Institute’s views on “intelligent design.” At the same time, Mims’s association with that group does not invalidate his role as a leading figure in the American amateur science community, any more than James Watson’s dubious speculations about race take away from his groundbreaking research on DNA. Watson’s speculations about race are certainly distressing and uncalled for, but Discover’s editors are wise to spare themselves much grief by taking the firm stand that they have. Science motors along on facts, so political correctness is not one of the branches of science. As a scholar pointed out to me years, ago, political correctness is typically the refuge of third- and fourth-rate academics. It can reduce a discipline that was once a source of knowledge and understanding of our world to dense, frightened babble. The further the mag stays away from it, the better. 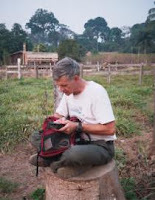 Mims, probably best known for his electronics work, is also a keen environmentalist and supporter of amateur science as a support to professional science. Forrest also offered a link to this video account of the “Scientific American” affair (in which he was refused a column years ago – though that seems to have been patched up, as he has written for them since). Darwin blah blah blah in Toronto? Science fiction: Remake of Day the Earth Stood Still supports Rare Earth hypothesis? And not Carl Sagan? Did Plato influence Charles Darwin? Thumbs up to Discover Magazine for at least having the guts to keep a scientist who doesn’t hold to their own views! Mims always personally complimented my writing about analogous systems and processes between living things and human engineered things. He was something of an inspiration to me when I was younger. My first computer was a homebuilt Altair 8800 and I was building Radio Shack electronic projects since age 12 or so. Mims is about 10 years older than me. Science motors along on facts, so political correctness is not one of the branches of science. The phrase political correctness used to be a way of describing mindless conformance to received views on moral and other issues. Now it has itself become a cliche and a substitute for an argument. Apply it to any vaguely left-wing widely accepted view and you appear to have said something without actually doing so. Political correctness is real – it destroyed the career of Harvard’s Larry Summers, for example. The identifying mark of PC is that no one cares about the facts of a case, only about whether what is uttered is correct thought. Political correctness benefits mediocrities because they are rarely at risk of challenging a consensus. Here’s a thought: Suppose the editors of Discover knocked ten scientists out of their 50 Best Brains for PC reasons. They would then replace them with people of lesser achievement and greater PC. Multiply this through a whole society and you have a powerful force for mediocrity. The phrase political correctness used to be a way of describing mindless conformance to received views on moral and other issues. It stands for something much worse now — the requirement to not express certain views, regardless of their truth or the sincerity in which one holds them, with severe economic or legal consequences for those who violate this requirement. Political correctness is something thinking people should oppose.